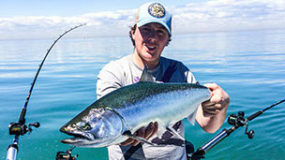 One of our clients Joseph Lane was thrilled to reel in a Salmon Derby Contest winning fish last August. 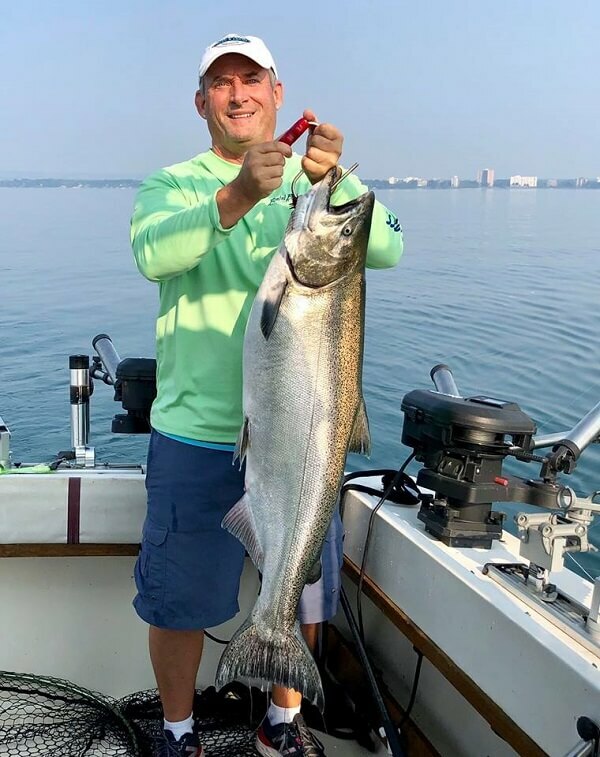 He won a top 10 official prize in week 6 of the 2018 Great Ontario Salmon Derby. It was a quiet and calm morning on the water in front of Bronte Harbour in Oakville. Joe was fishing with 2 other people on the boat. We had a great morning of fishing, catching quite a few salmon from 12 to 22 pounds. The top 10 derby salmon took a green fly that morning. When the rod was handed to Joe, the fish just kept screaming out line. It went on and on and on. Joe was like what’s going on ? Is this thing going to slow down, lol. After the initial run of about 5 minutes, Joe had quite the battle on his hands. Everyone knew it had to be a big fish. It stayed out far and down deep. No sign of the fish for about 25 minutes. Then finally the fish came to the surface a hundred feet back and we could see then this thing was big! It took another few minutes for Joe to get the fish a little closer where we could see that big tail. You could feel the tension in the air as Joe patiently played the fish hoping not to lose it. It took Joe about 30 mins in all to finally get this big salmon to the boat. The whole time was nerve breaking. After a strong battle of back and forth the fish was finally tired. Once he finally got the fish to the boat the netting was easy with no issue. Thank goodness said Joe! This was one of my best fishing days ever said Joe! Ready to book a fishing charter ? Just click the button below. Welcome to Myles Ahead Sportfishing. We are a family owned and operated professional fishing charter service; operating on Lake Ontario. We offer full day or half day fishing charters. Our services are provided out of the Bronte Harbour Marina. Our company is based on the belief that our customers’ needs are of the utmost importance. Our entire team is committed to meeting those needs. As a result, a high percentage of our business is from repeat customers and referrals. We would welcome the opportunity to earn your trust and deliver you the best service in the fishing charter industry. And you could win a prize in the Salmon Derby like one of our clients did in 2018. Great Ontario Salmon Derby Entry Included.